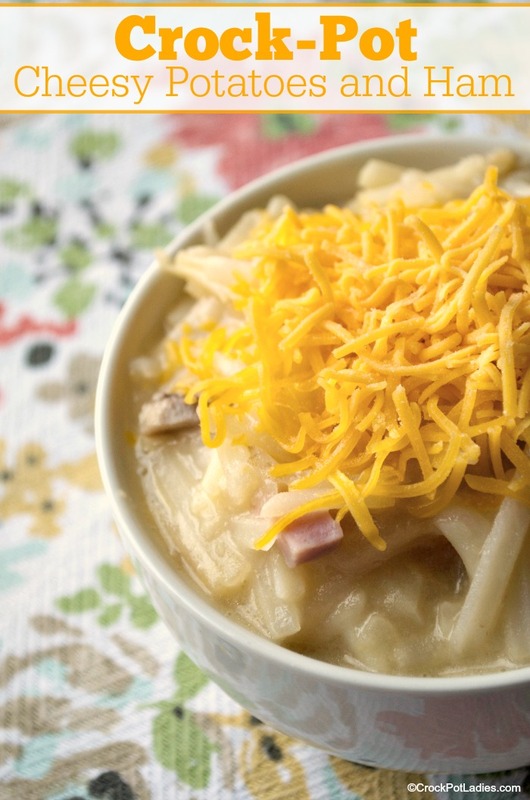 This recipe for Crock-Pot Cheesy Potatoes and Ham is included in our 10 Easy Crock-Pot Freezer Meals Meal Plan that you can purchase in our store for just $1.99. The meal plan includes 10 great freezer meals that you can prepare ahead of time and have ready to go in your freezer. You will also get a printable grocery shopping list for all the ingredients needed to make all 10 meals as well as printable labels that you can stick on your freezer bags. That all being said, you do not have to freeze this meal first. You can just whip up this yummy dish and serve it as either a dinner OR breakfast that your family will love! I really love making this recipe because I don’t have to deal with any sort of raw meat. Because let’s face it, raw meat is sort of gross. I purchased and used a couple of ham steaks that are easily found at just about any American grocery store. But if you have leftover ham from say Christmas or Easter this recipe would be a perfect way to use some of that ham up. For the potatoes I use frozen hash brown potatoes, either the diced or shredded kind will work. Frozen potatoes are just super easy and you don’t have to spend any time peeling and cutting up potatoes. But if you want to use fresh potatoes you of course can do that. Just be sure to rinse your cut or shredded potatoes very well to remove excess starch. There is plenty of salt from the ham in this recipe that to avoid an overtly salty finished casserole, it is best to use low-sodium cream of mushroom soup in this recipe. I personally have zero aversions to using cream-of-something type soups when I cook from time to time. However if you would prefer not to use them you can use this fabulous recipe for Cream of “Something” Soup Mix from One Orange Giraffe. I have used this mix for at least 10 years and it works great! This slow cooker recipe is pretty versatile in that you can use other “cream of” type soups or even add in some vegetables. One example I like is adding frozen broccoli florets and using cream of broccoli soup instead. Super yummy! Ham, frozen hash brown potatoes and handful of simple ingredients are combined in this easy casserole type recipe that can be served for dinner or breakfast. 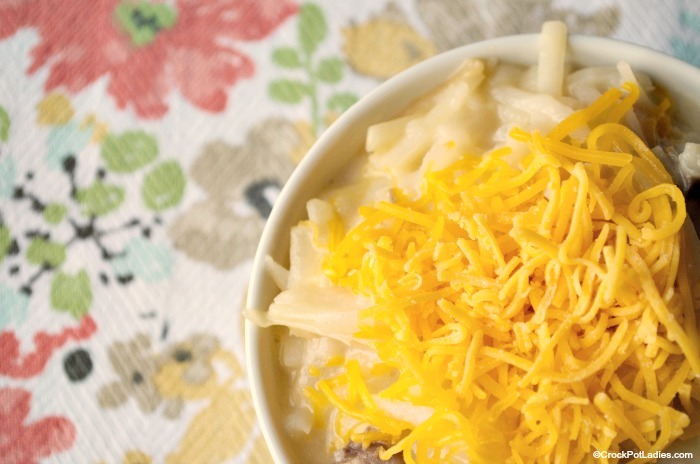 This recipe can also be made into a slow cooker freezer meal for days when you are super busy. Combine all ingredients in a 6 quart or larger slow cooker and mix to combine. Add all of the ingredients to a 1 gallon sized zippered freezer bag and squish the bag several times to mix the ingredients in the bag. Lay the bag flat on the counter and push out excess air while sealing the bag. Label the bag with the name of the recipe, date frozen, ingredients and cooking instructions. To cook, place all ingredients from the freezer bag into the slow cooker and cook for 6 hours on LOW. This recipe was first published in February 2014. And we have decided it was time for an update. New photos, as well as special diet and nutritional information has been added. We hope you enjoy! What , no eggs ? No eggs in this recipe as it is not really a “breakfast casserole”. Turkey Sausage? Stir fry type cuts of beef that are cut very small would work well too. I would think that chicken or turkey would work just fine. My wife just made this recipe (without any freezing) and didn’t deter too much from it, but, while we thought it was really flavorful, it came out more like soup. Any thoughts on what may have went wrong? Ours came out like soup too. What did I do wrong? The only thing I can think of, is the crock pot temp is far off from what I was using….so the water didn’t evaporate out. I would probably cut it down to one can of water and see if that helps it. You can also leave the lid off for an extended amount of time to help the water boil off. Ours wasn’t soupy at all..it was rather thick..so I’m a bit perplexed. I have not personally made this recipe, but I have had an unusual experience related to it that I wanted to share, in hopes of changing a single key element of websites like this and the users who post their recipes. I really think most just have not thought of it and I am certain others have run into this as well. One of my 11 year old twins (Hannah) was diagnosed with Type-1 Diabetes in April of this year. As you may imagine, this has caused a multitude of changes on our family, but one of the more difficult aspects to manage is the CONSTANT NEED to know exactly how many carbohydrates she is eating in her meals; her carb intake has to be compensated with insulin to balance her blood sugar. Recipes like this one, while quite yummy, create a big challenge in calculating what number of carbs are consumed per serving; especially when prepared by others in other places. I would think that this ‘nutritional information’-(see note below) would be fairly easily calculated in the process of preparing, and just as easily posted within a recipe website/forum like this. If the practice of calculating the combined carbohydrates or a better option would be listing them individually next to each ingredient could become common-place within the recipe sharing community at-large… Type-1 Diabetics readers, and their parents! !, as well as Aunts and Grandma’s in my specific situation :-), would be eternally grateful! I used this term even though I do not mean the complete guide normally seen on the side of most food packaging we all buy. I completely understand that trying to combine all of these amounts and figures would be impossible for all of us except those who happen to be an Actuary, Statistician, or US Tax Accountant. All I am requesting/discussing is keeping track of the carbohydrates in each item. I am aware of many other medical conditions that require knowledge of specifics in food (salt and gluten as examples), but a deduced or educated guess type of answer can be used in these cases. However, a miscalculated insulin injection can literately kill someone (someone very special to me!). Please remember for the future… A little additional detail in your recipes (remember accuracy really counts!) will help my family and I, as well as all others in our positions, fear the potential miscalculations from guessing a great deal less! Hi Jayson, I really do appreciate your comments and adding nutritional information to our recipes is something we would love to be able to do at some time in the near future. The problem lies in that we are not nutritionists and there really isn’t an easy program that we have found that can help us offer the nutritional information that we have been able to find. But we will continue to look for one. I wish you and your beloved daughter Hannah well and hope eating this casserole did not cause her any harm. That of course is never our intention. 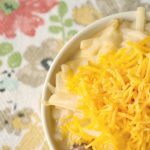 We are just three ladies here sharing our favorite recipes. Jayson, My daughter also has type 1 diabetes, she’s had it for almost 8 years now. This type of recipe can be a challenge to carb count, but one easy solution is to add up all of the carbs you add into a recipe and then divide it by the servings (you’ll need to also keep track of your volume to do this). You can get a pretty accurate carb count doing it this way. Have you tried, or what would you think, about using fresh potatoes that you have diced yourself? We grow a lot of our own veggies and have plenty of potatoes. Thanks for the recipe! I think that should be OK to use fresh potatoes. I’m still trying to find out where I did this wrong but.. what I ended up with was WAY too much for one gallon freezer bag! I haven’t added any water or broccoli yet and was just able close the bag. I may split into 2 bags and not add any water until cook time. *Fun fact: I grew up in Kansas and now live in Iowa after a few years in Colorado. Every place has it’s perks and quirks – say HI to the Sunflower State for me! Well how strange! I didn’t have any problems with my first set of recipes (but ran into this with the second one, that I haven’t published yet). Kansas says Hi Back! I cannot possibly see how anyone could get all of this in a one gallon freezer bag. I left out the water and the big bag of potatoes, and the cheese and still could barely get the bag closed. We marked on the bag what was missing so we could add it to the recipe when we put it in the crockpot. I suggest adding the water a little at a time while it is in the crockpot so you don’t get it too soupy. Also this did not in anyway thaw out overnight in the fridge, it was stil frozen solid. I recommend starting the thawing process earlier the day before. Hi I was planning on making this tonight, I could only find ready serve low sodium cream of mushroom soup by Campbell’s, should I still use the water or no? What approx weight is a medium bag of potatoes? approximately 28 ounces. does not need to be exact. My husban likes potatoes to be crispy. When I made this them seemed mushy. How can i make them crispy? you know, with all the crockpot dishes I have made with potatoes I haven’t had crisp potatoes. You will probably have to do them in the oven. I like a lot of potato dishes that are crispy as well, depending on what kind it is, so I totally get it. He’s looking for more of a scalloped potato, but I think that will work better in the oven, where the moisture won’t be trapped in. Can you use regular tater tots with this? I haven’t done it, but I don’t see why not. I noticed that your quantities are different on the recipe as compared to the quantiries on the sticky note photo on your main freezer meal page. Perhaps that’s why Morgan and others are having issues. 4 cups broccoli seems like a lot for example. The sticky note says 1 cup. I have bought ingredients, but not started yet…I’ll wait for your reply. Thanks! I looked up what you noticed, and you are correct. I adjusted the amount of broccoli. I’m sure that is why the bag wouldn’t close, but I don’t think that would make a soupier meal. I think I’ll have to make this again, and see if I can duplicate what people are seeing. I too wound up with a soup. Although it was absolutely delicious, it was not what I expected at all. We loved it none-the-less and I am actually going to be making it a second time. I too could BARELY close the bag, so I’m going to omit the potatoes o’brien in the zip lock bag and just know to add it to the crock pot. I am sorry your cake did not come out Mary, what recipe were you trying? This comment is on the recipe for Crock-Pot Cheesy Potatoes and Ham and not on a cake recipe so I am not sure what recipe you were attempting.